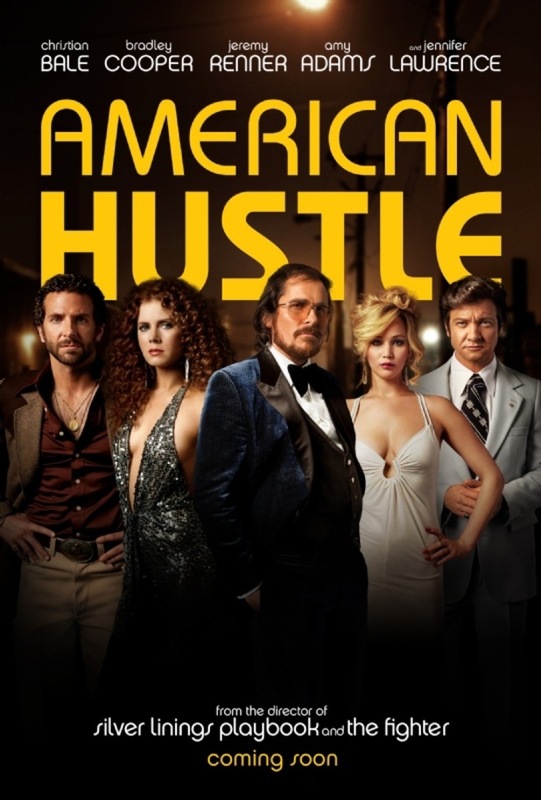 “American Hustle” is something I used to be known for, and now it’s a new feature film by Writer/Director David O. Russell (“Silver Linings Playbook”). In one of the best opening scenes ever, we find Irving Rosenfeld (Christian Bale from “Out of the Furnace”) applying his hairpiece and weaving in his comb over. This represents Irving’s entire life and the theme of the movie; what you see is not what you get. Irving cares what he looks like while just about everything about him is false. He’s a small-time con artist who meets his match in Sydney (Amy Adams from “Man of Steel”). Both of these people are flawed and fragile and very good at not letting anyone know who they really are. When these two are busted by FBI agent Richie DiMaso (Bradley Cooper from “Silver Linings Playbook”), they are forced to help him pull a few scams to bring down some big time criminals and corrupt politicians. This could have been a full season of the Sopranos with a huge cast of characters and more plot twists than a plate of spaghetti. But they jammed it all into one movie – assisted by voiceover. I can handle voiceover as an appetizer, but when we are halfway through the movie and I am still having things explained, I get indigestion. It’s as annoying as when I hear someone whispering the plot to the person next to them. I just wish everyone would just shut up and watch the movie – including the narrator. It would be just wrong for me to complain about Amy Adam’s breasts and the countless number of “peek-a-boo” dresses she wore. I understand they were intended to distract the “mark” but at some point they distract from the story. Speaking of breasts, I have to say that Jennifer Lawrence (“The Hunger Games”) as Rosalyn steals every scene she is in. This is a charming movie, and an excellent romp, but I was not conned. I’d say “The Grifters” (Stephen Frears – 1990) is a much better treatment of this kind of sordid confidence man. The Richie character is mostly cliché’ and we barely get a glimpse behind Irving’s sunglasses. They do a better job with Sydney and Rosalyn, but I am not buying it. There is a great supporting cast and a soundtrack that I literally have on 8-track tapes somewhere in my shed. This was a fun movie, and though based in fact, it comes off as a farce. I would say it’s more like a “popcorn movie” than an incredible film, but sometimes you want popcorn. I give this movie 3 ½ stars out of 5, and now I have to go find my 8-track tapes. There’s always someone conning the other, which can bring on a lot of confusion, as well as a whole bunch of fun, which makes this an absolute blast to check out. Good review Tom.